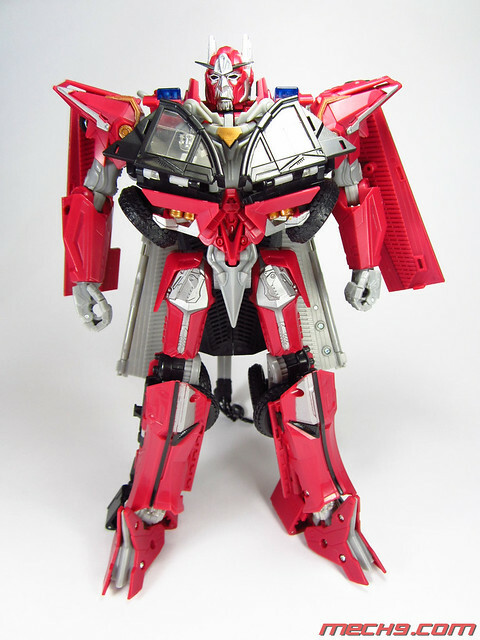 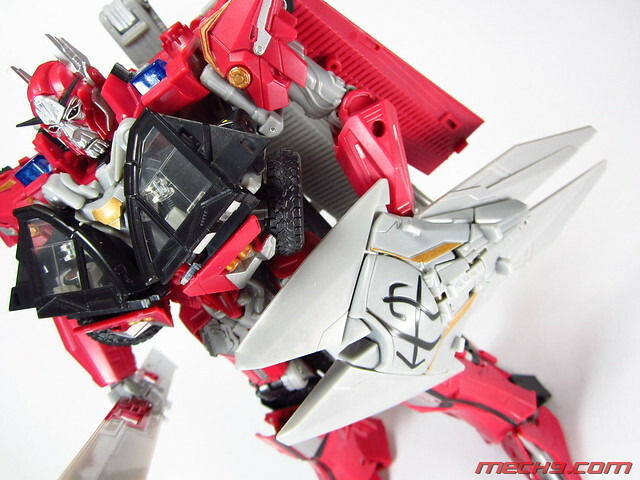 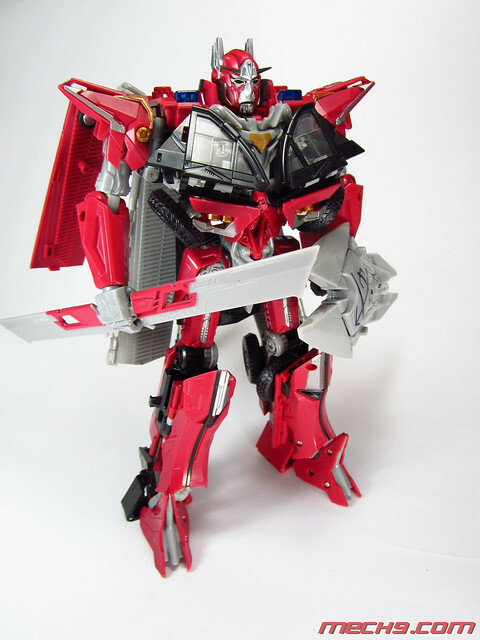 Leader Class: Sentinel Prime by Takara-Tomy/Hasbro from the recently released Transformers:Dark of the Moon Movie. 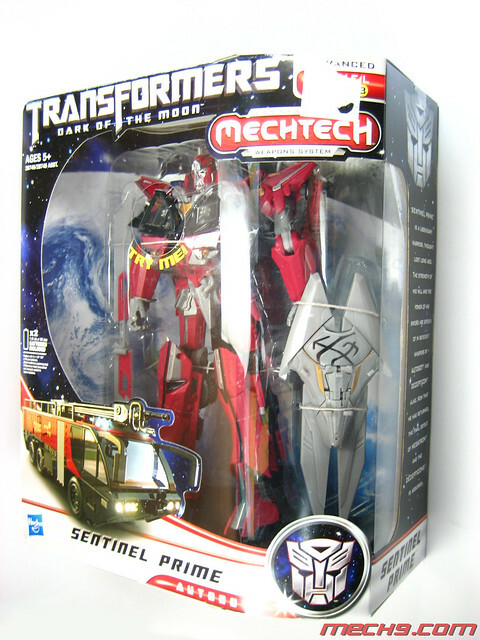 In the movie, Sentinel Prime was one of the Primes that crash landed on the dark side of the moon that according to the fictional account of the movie was what set off the race to the moon. 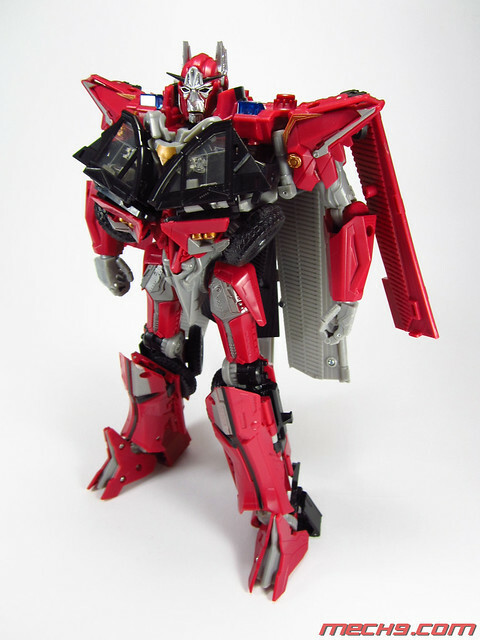 He was voiced by Leonard Nimoy who also voiced Galvatron in the Transformers movie that came out in the eighties. 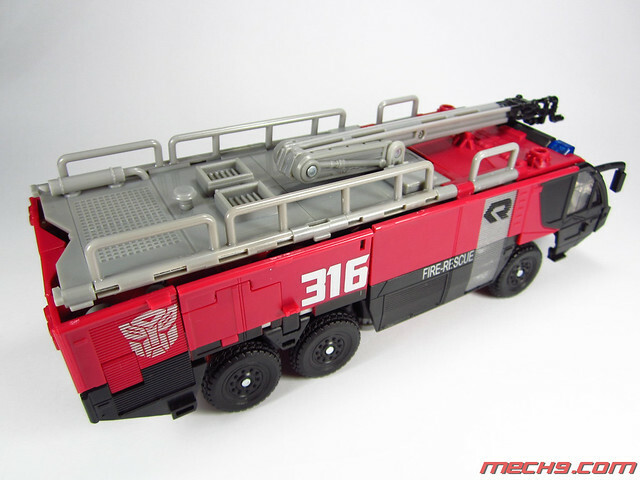 First things first, a short summary of this toy. 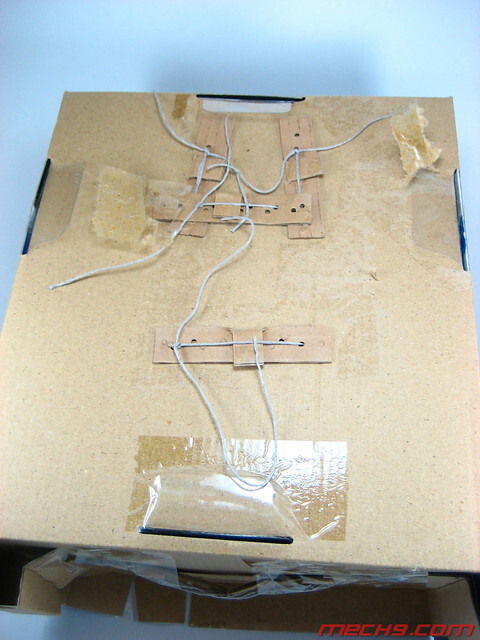 Its actually quite good craftmanship but with a little short comings. 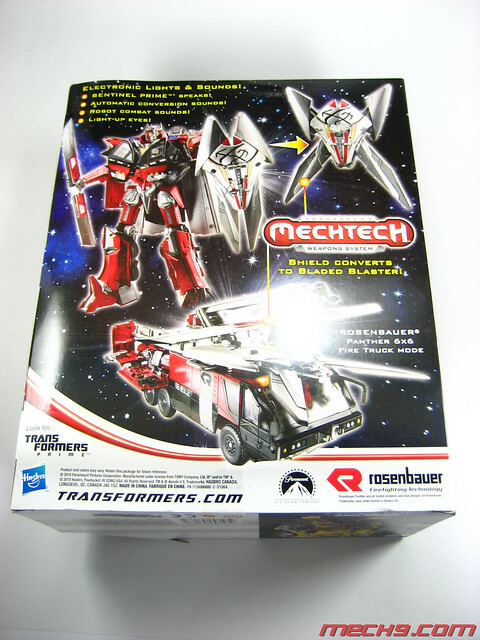 Bottom line, its a great toy but not for the minimum age group that's written for the box because of the complexity of the transformation sequence. 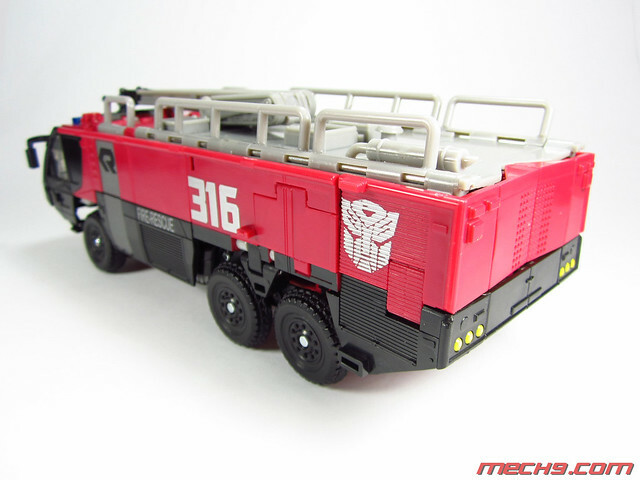 The way my son plays with this is that I am the one responsible for transforming it to robot mode from truck mode and vice-versa. 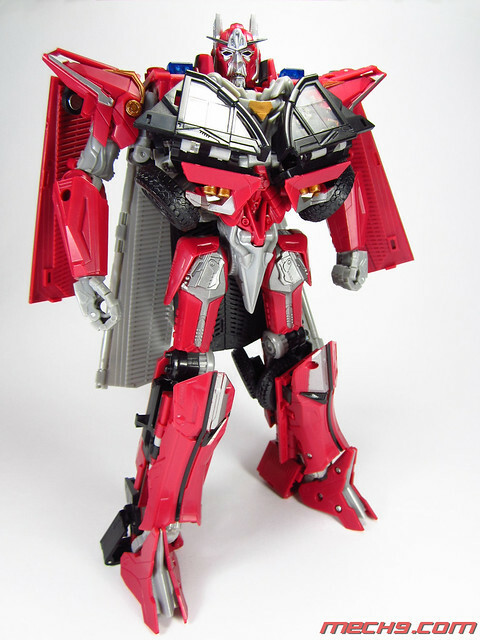 Mechanically wise, its actually a beauty in terms of the transformation sequence. 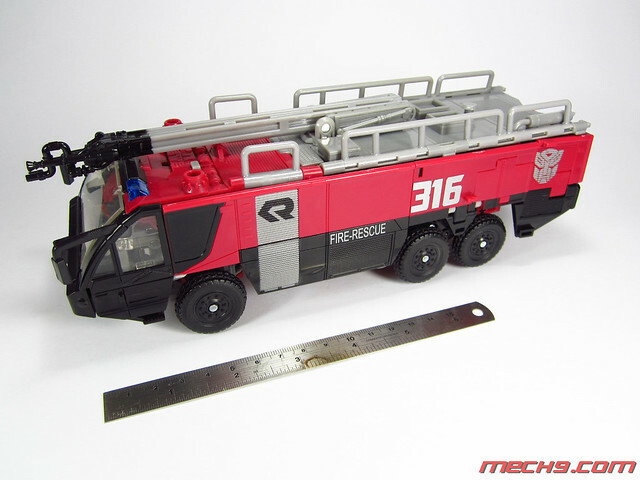 Another problem with this is the balance of the toy, because it is back heavy it has a tendency to topple to the back, what I did was to use the firehose to help prop up the toy in robot mode. 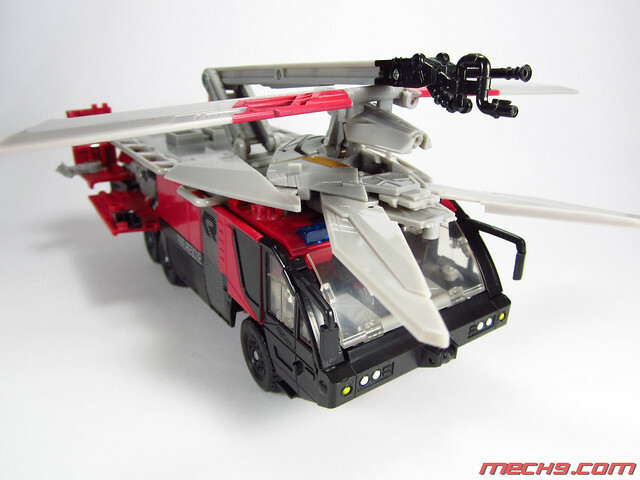 Save for the negatives mentioned, I love this toy. 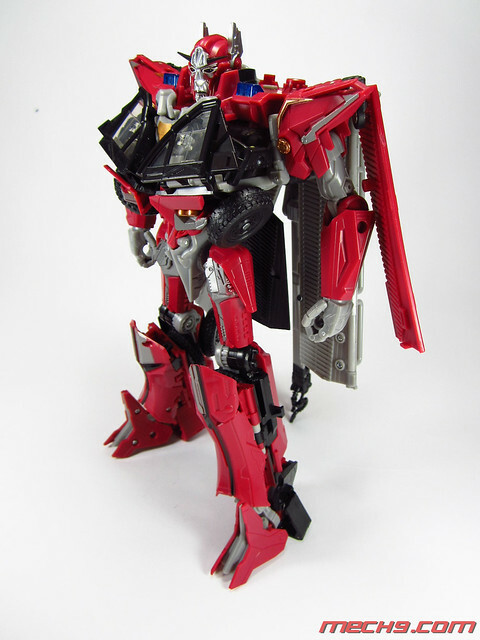 I like the robot mode of this because the proportions look great as compared to the Leader Class Optimus Prime. 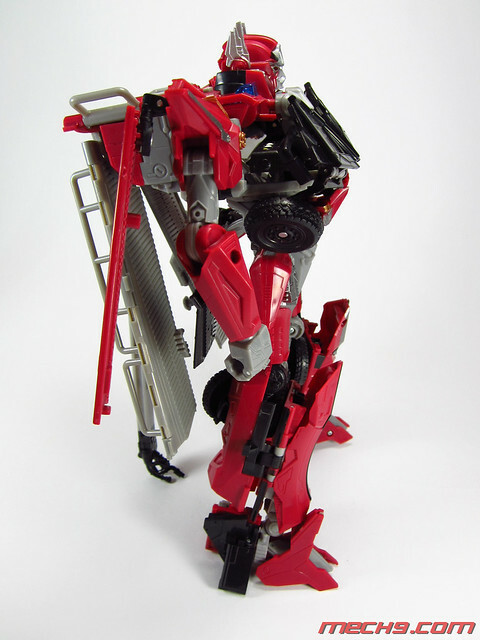 And despite the difficulty of understanding the transformation sequence, I really love the complexity of the transformation sequence and how the parts mesh with one another in order to transform. 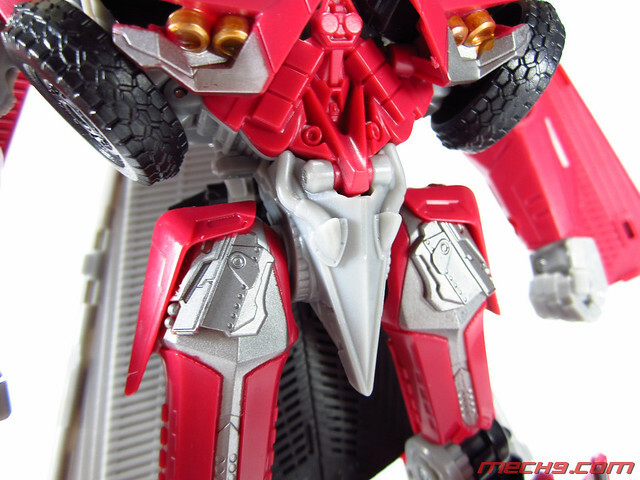 Review is continued in the succeeding pages. 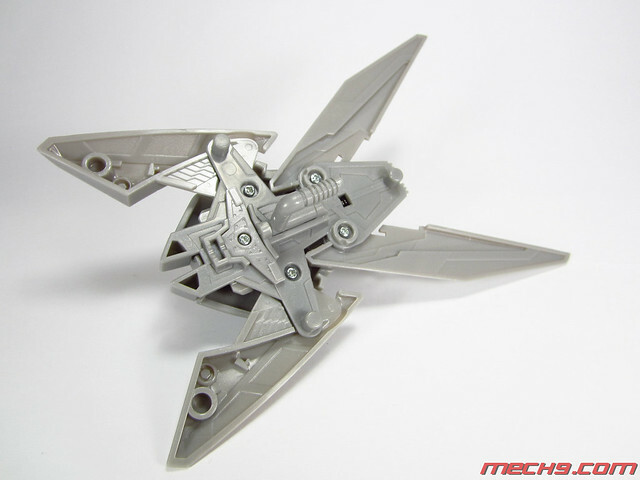 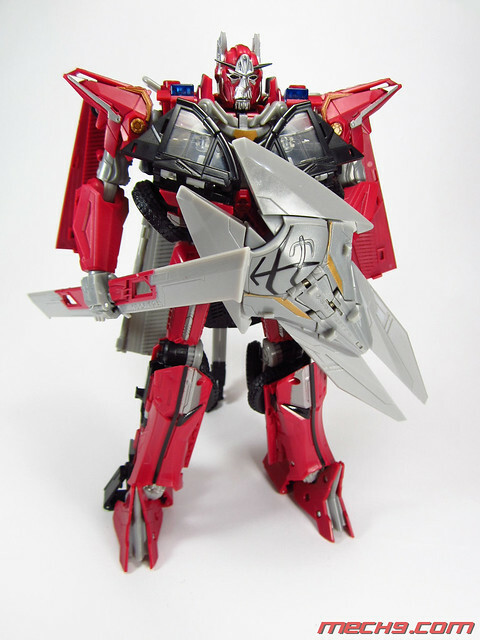 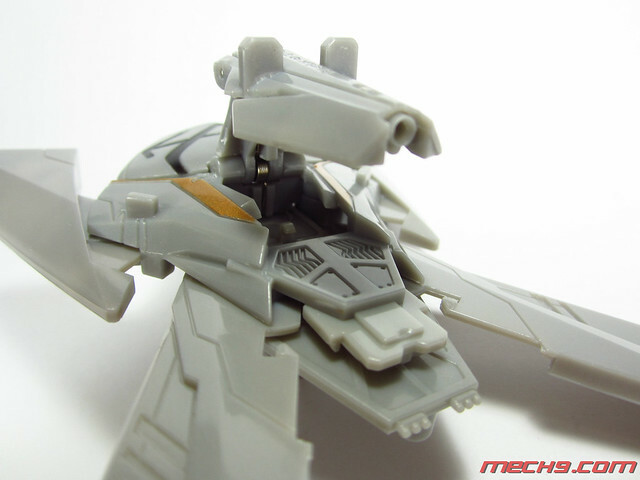 The toy comes with a transforming shield and a double bladed sword that can be folded. 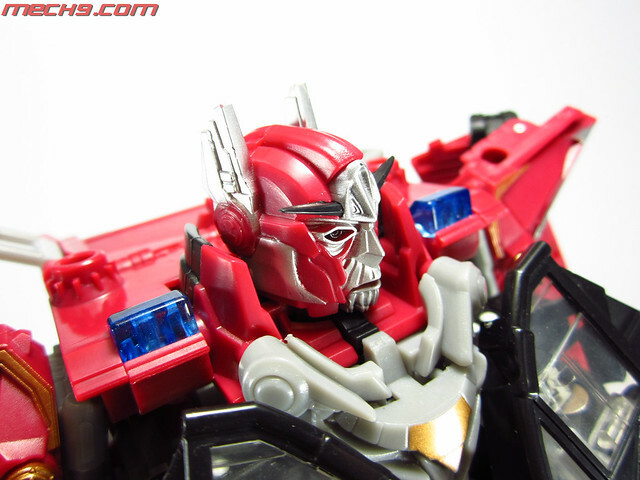 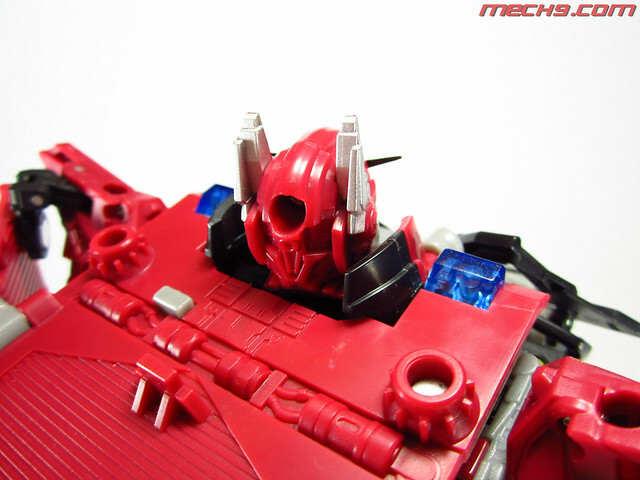 Pressing on the chest during robot mode will make the toy's eyes light up and it will speak " I am Sentinel Prime." 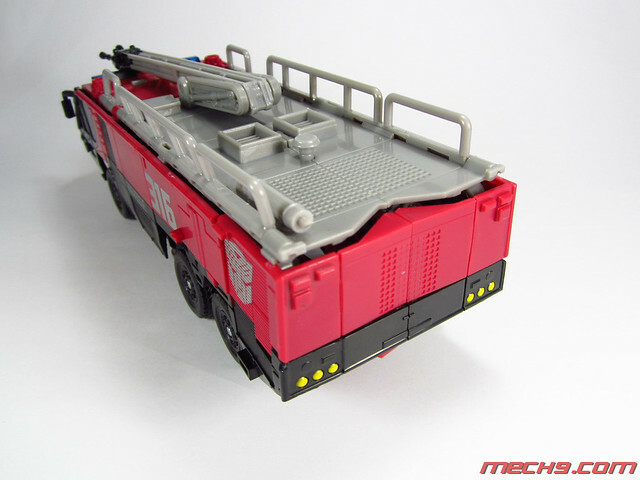 In truck mode, mounting the shield at the top of the cab makes the transformation sound and pressing on the shield button when its mounted on the top makes some firing sounds. 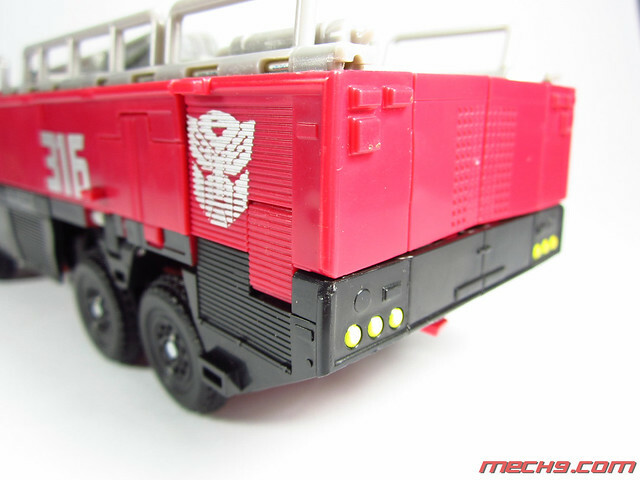 The truck can also make siren sounds when the button at the top of the cab is pressed. 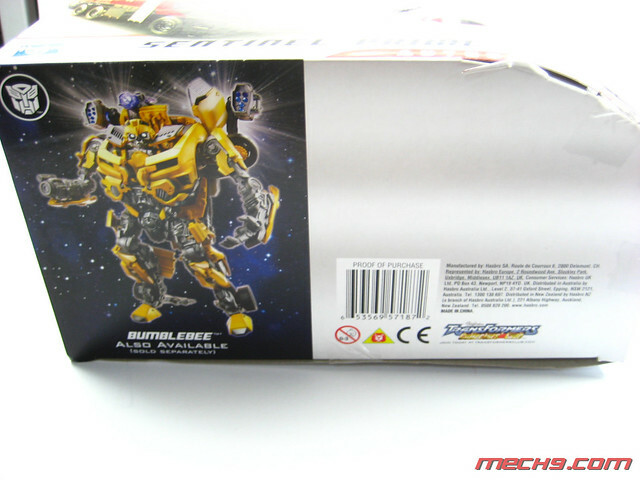 The toy comes already with 2 AA sized batteries that power the sound system. 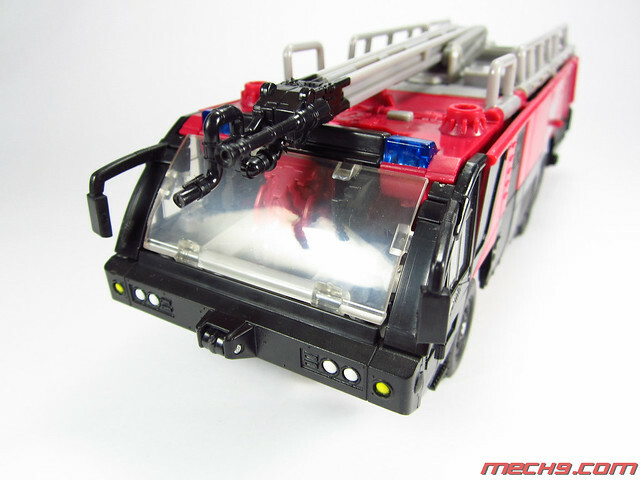 In robot mode, if there is a mechtech weapon mounted on the hole of the upper left shoulder and the chest button is pressed, Sentinel Prime will say: "what just happened to the all spark" as well as "good to see you alive Optimus"
Box shots of the toy. 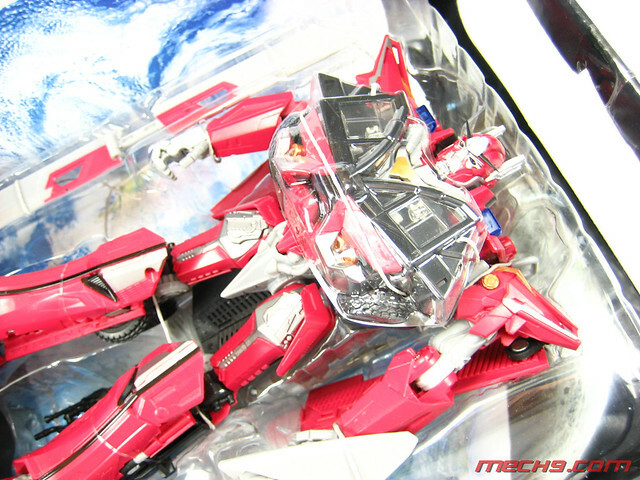 The box is heavily taped on the edges and comes in a glossy shade with a plastic see through window. 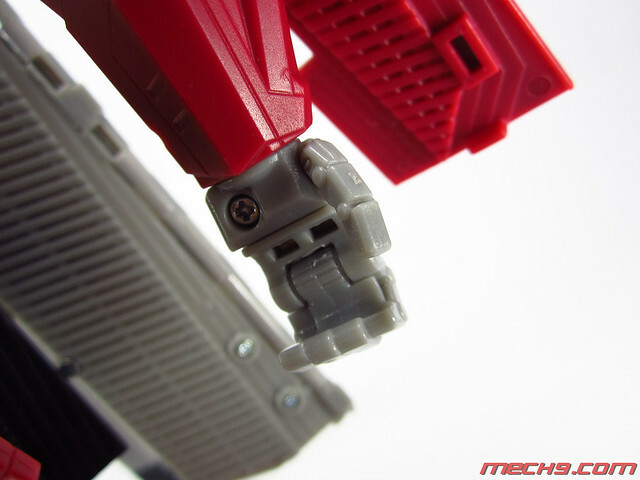 There's a hole where you can stick your finger through that allows you to press the button that makes the robot speak. 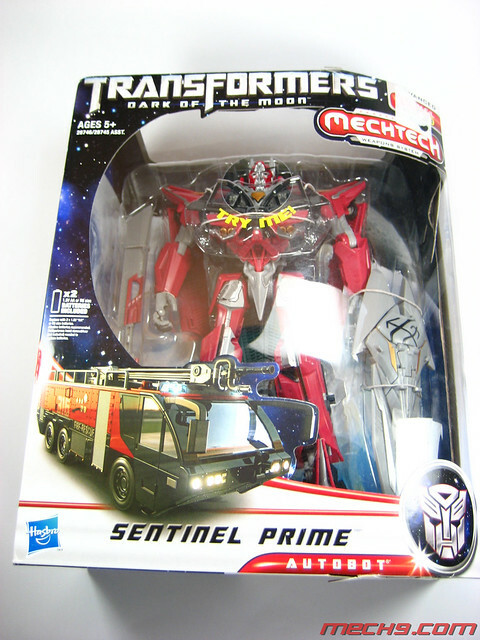 Sentinel Prime nestled in his vacuum plastic case that has a card board backing. 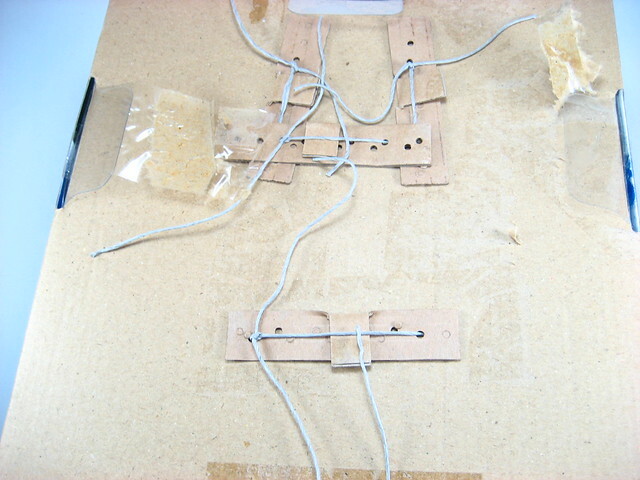 The toy is securely held in place with that looks like twine, there are some pieces of plastic string also tied around the frame to keep it in place. 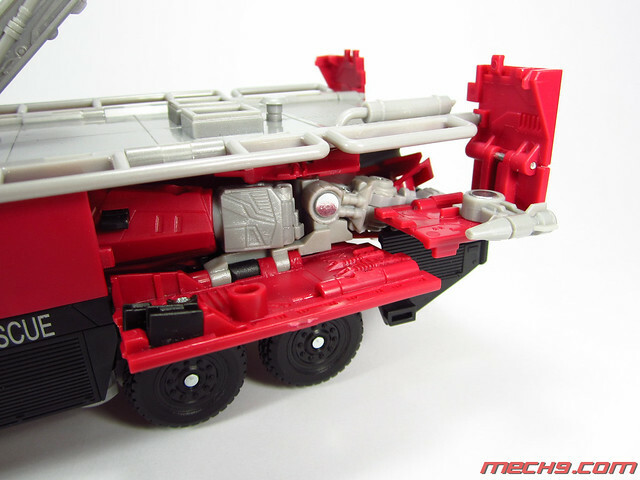 Some shots of Sentinel Prime in truck mode. 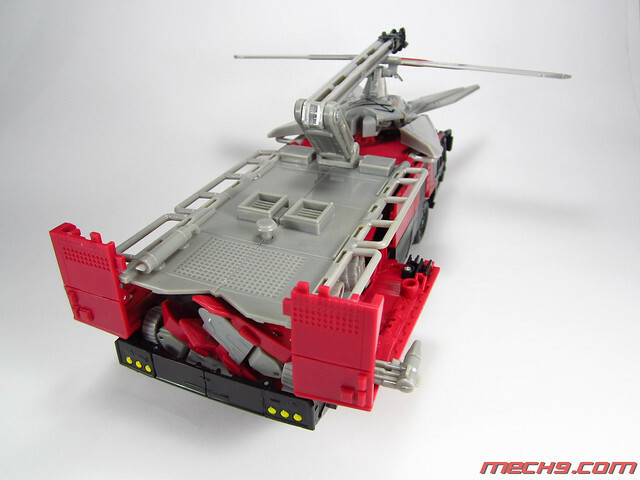 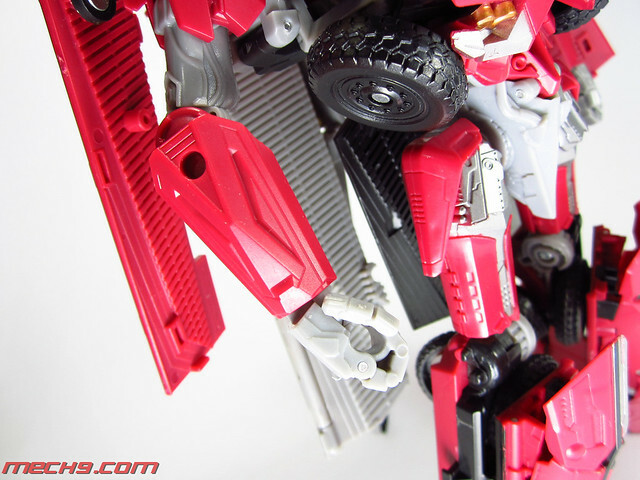 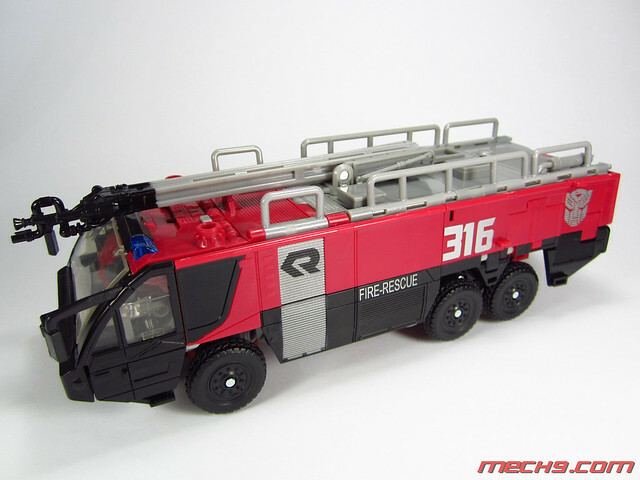 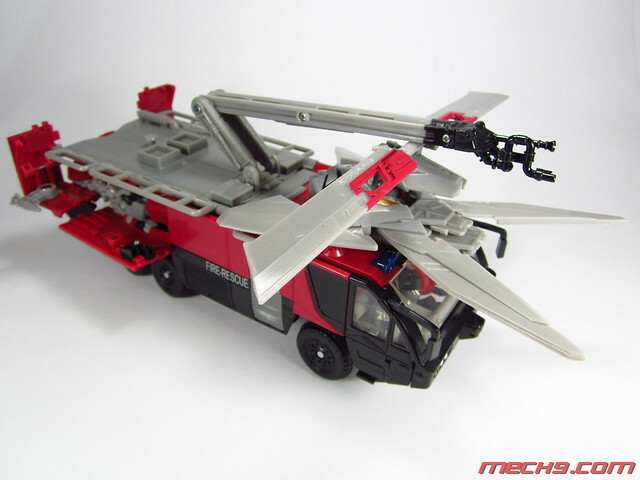 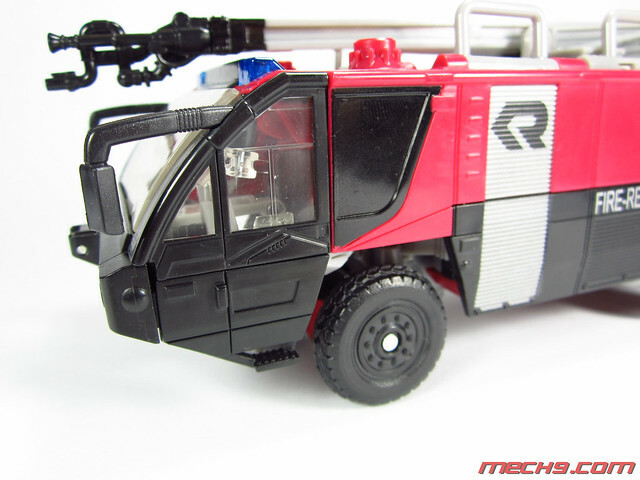 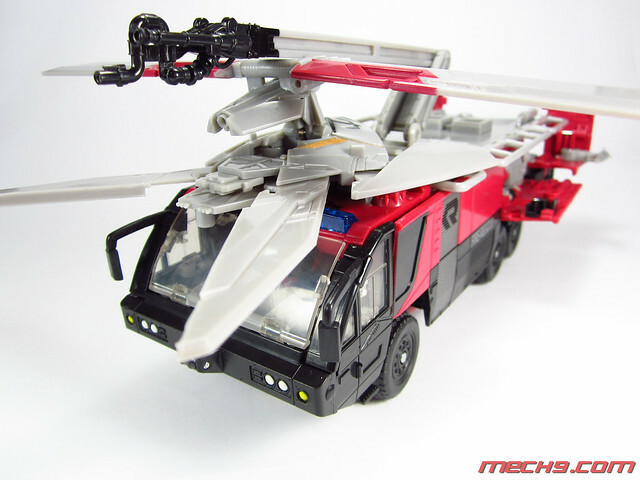 Sentinel Prime transforms to a Rosenbauer Panther 6 x 6 Air Crash Tender. 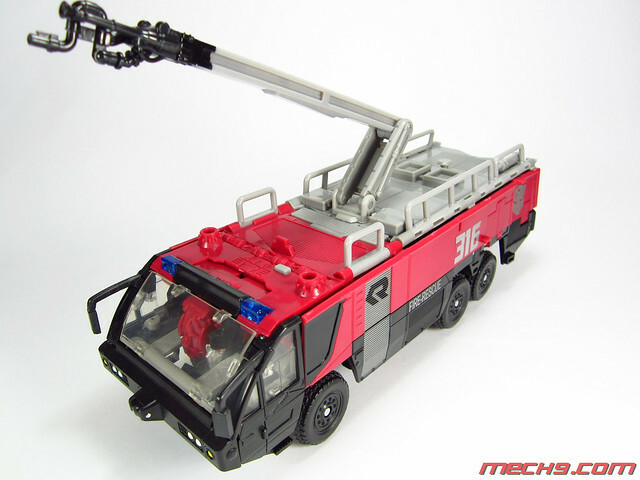 The Panther is primarily used in Airports for the said purpose of fire disposal with its telescoping hose. 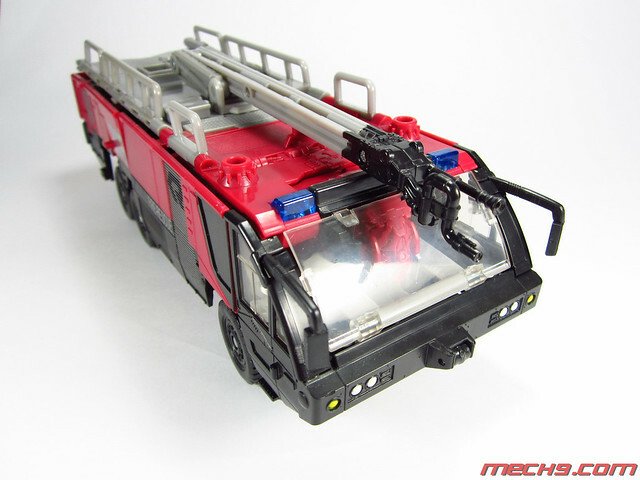 Hose perched at the top of Sentinel Prime can rotate and elevate. 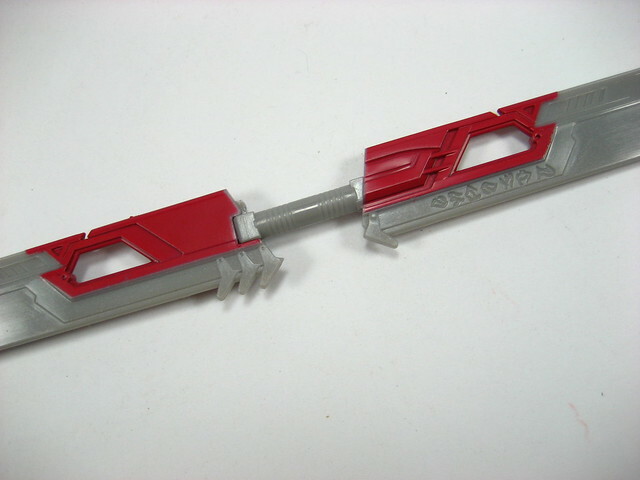 The hose nozzle at the end is not solid plastic but rather rubbery in composition. 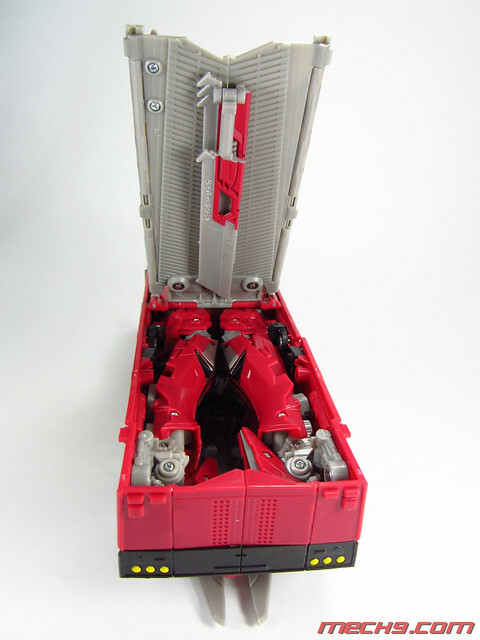 The top cover opens up to reveal the legs. 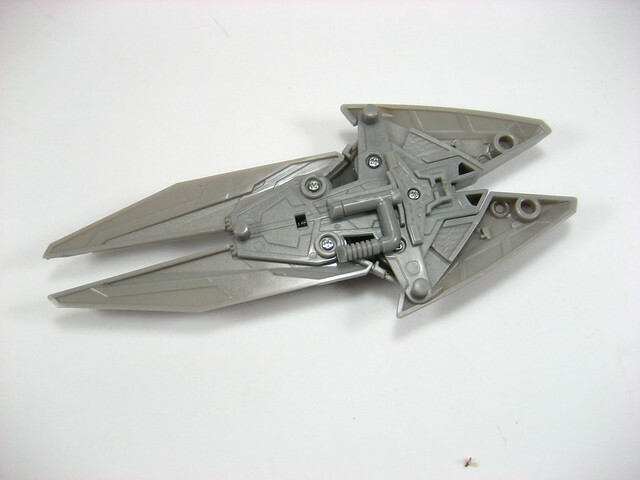 Still can't seem to figure out how the legs are supposed to go in this position in order for the cover to completely close and lock with the side panels. 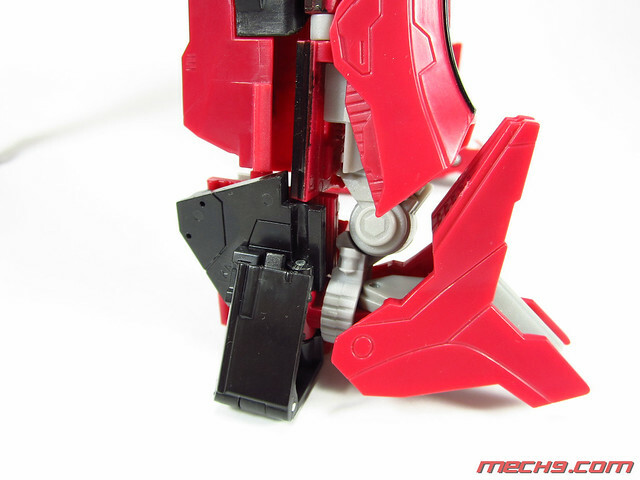 The lower legs actually open up and this is where you tuck in the arms. 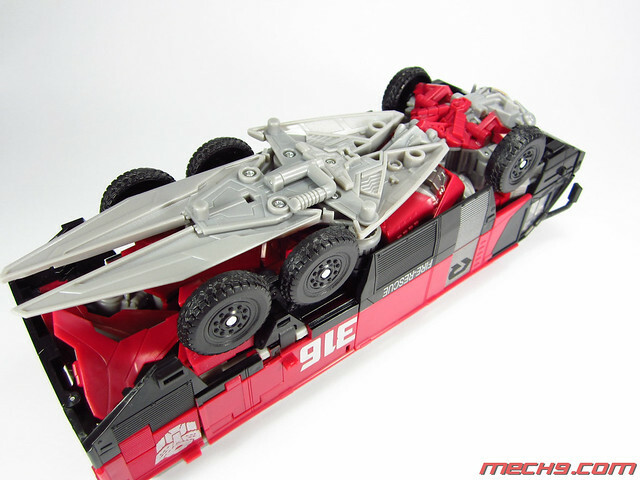 Quite a novel transformation sequence that's worth noting. 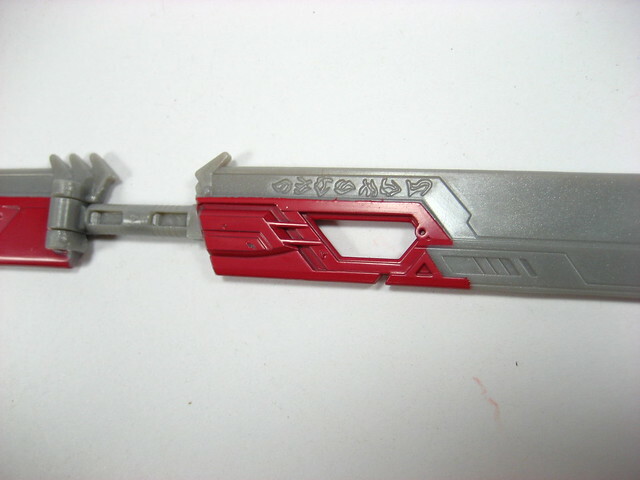 Because I didn't know how to tuck in the legs (because of the lousy manual), the top cover cannot securely fit on top leaving huge gaps between it and the side panels. 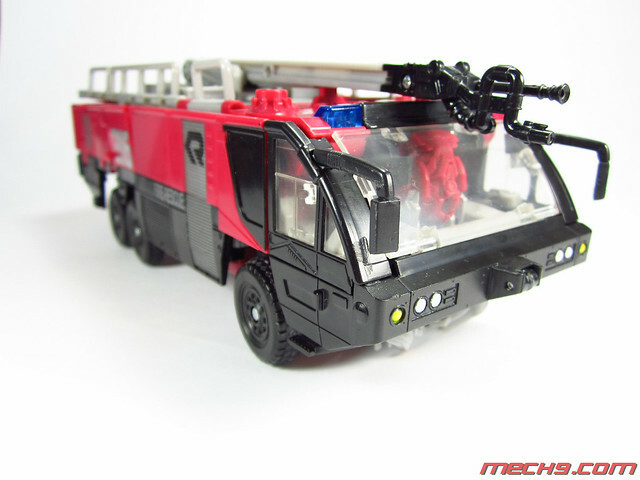 Nozzle at the end of the boom is made of soft rubbery plastic, that although bends easily, also springs back into place. 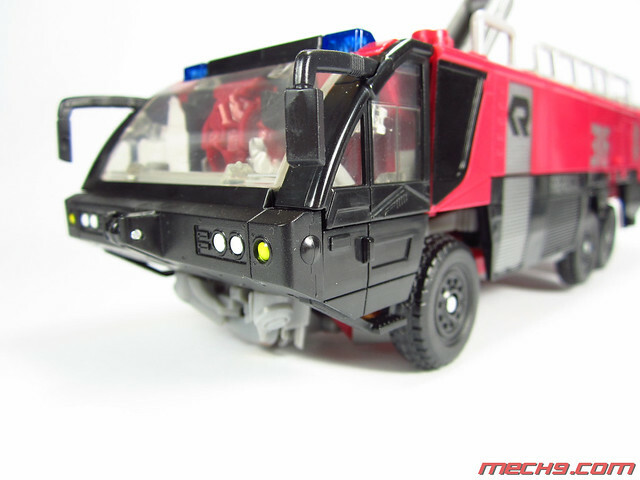 Front cab showing the side mirrors. 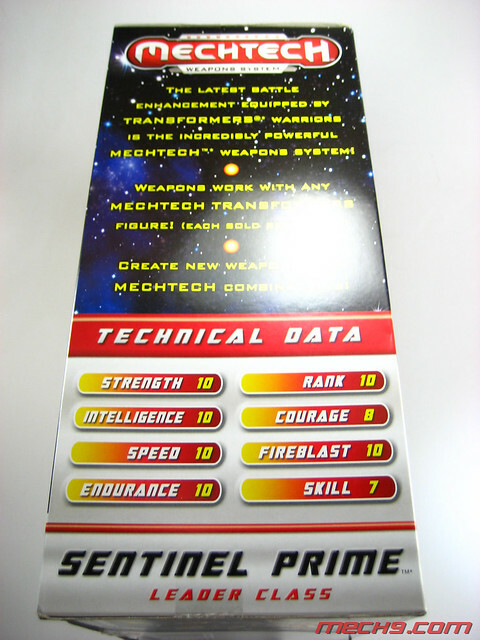 These are also made of soft rubbery substance. 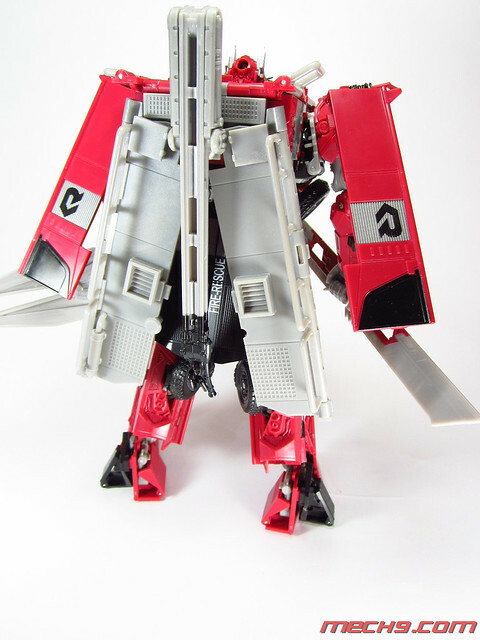 In robot mode it folds into the side of the doors. 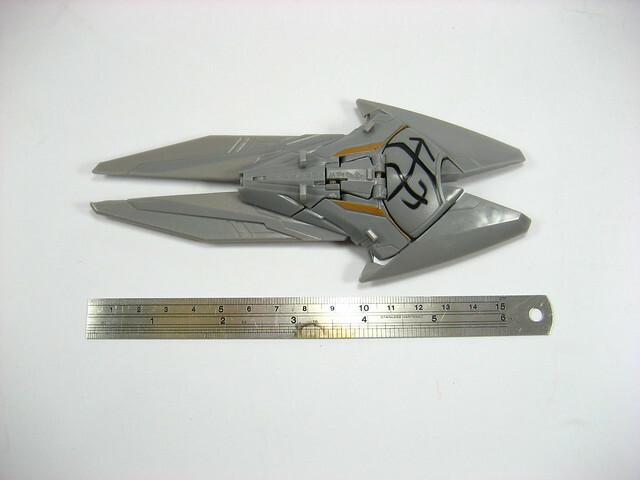 Placed beside the toy is a 6 inch ruler for comparison. 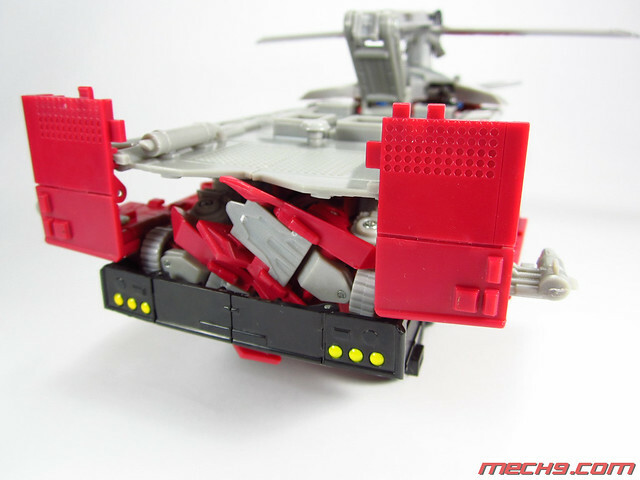 The shield and bladed weapon can be combined to form the Bladed Blaster that can be mounted on the top of the cab during Truck mode. 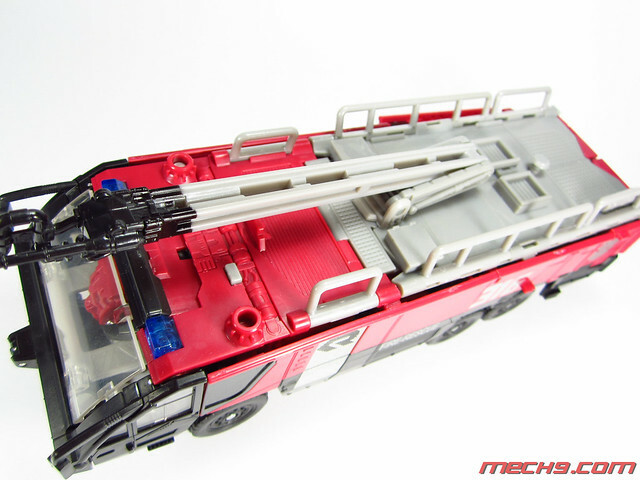 Aside from that, at the rear of the cab the side panels are lowered to expose the hose nozzles. 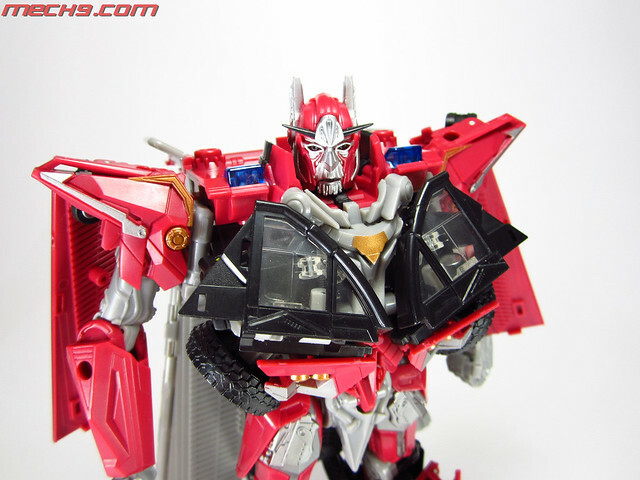 Shots of Sentinel Prime in Robot mode. 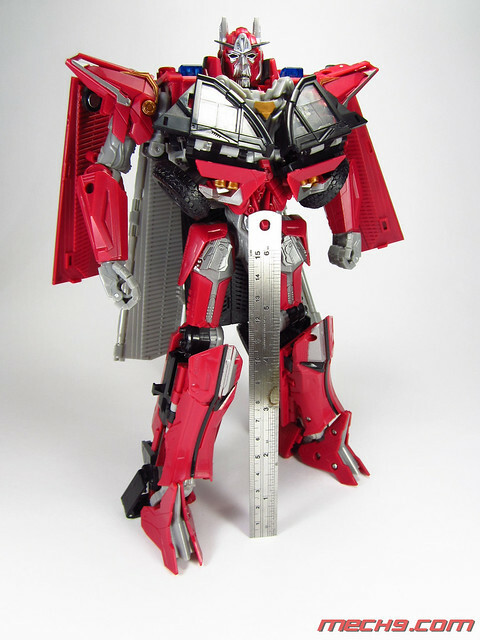 Sentinel Prime in Robot mode with a 6 inch ruler for reference. 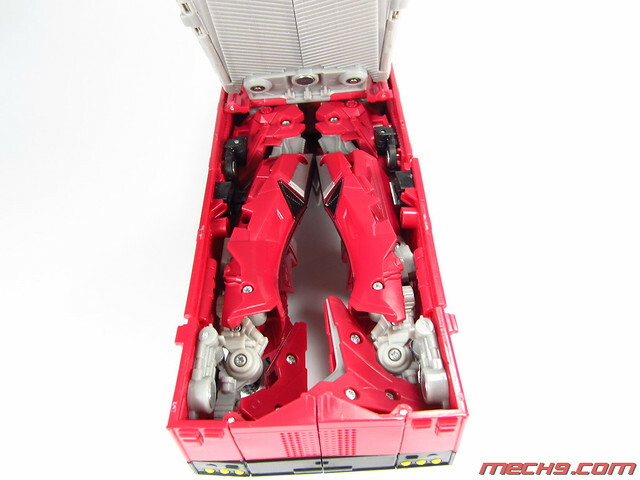 The lower legs open up in truck mode and the arms are tucked in here as part of the transformation sequence. 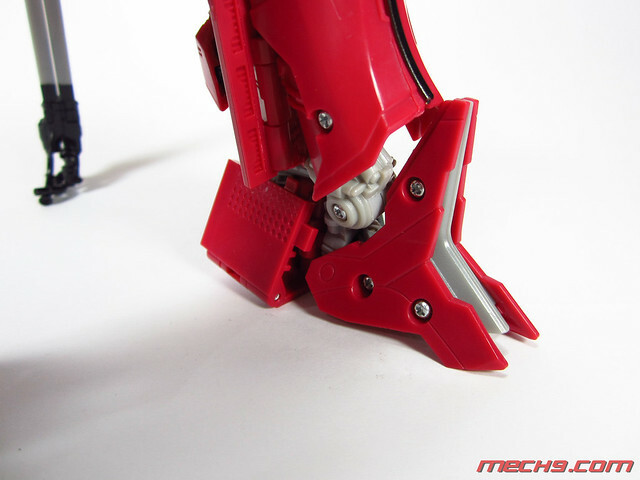 The knees can rotate in order to reproduce the "A" stance. 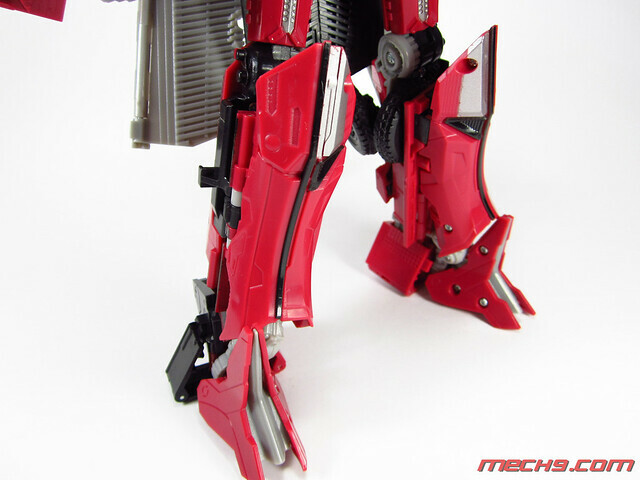 Back of Sentinel Prime. 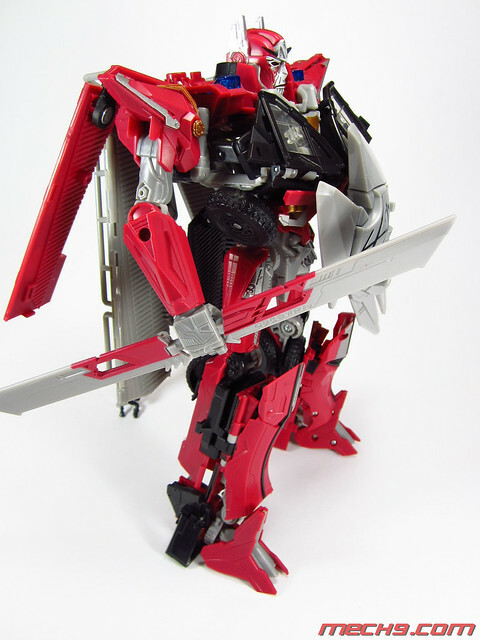 Because of Sentinel Prime is back heavy, resulting in a difficult time in standing up. 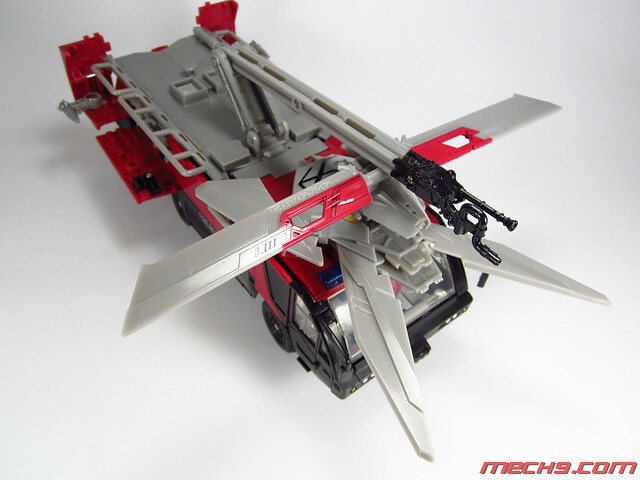 I often use the boom like a third leg to help prop the toy up. 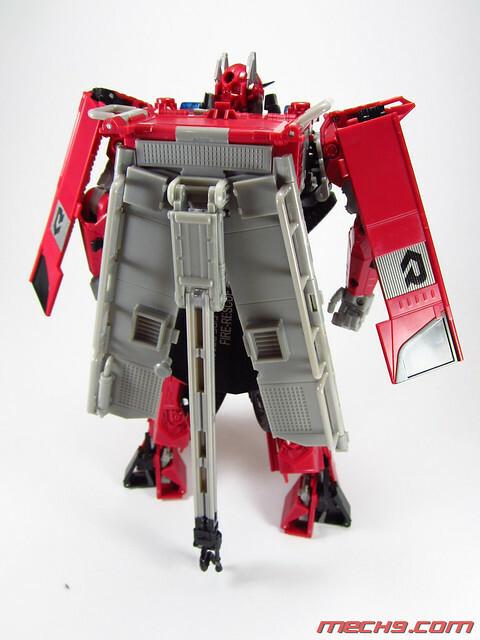 The back cover splits in the middle in order to act like a flowing cape for Sentinel Prime during robot mode. 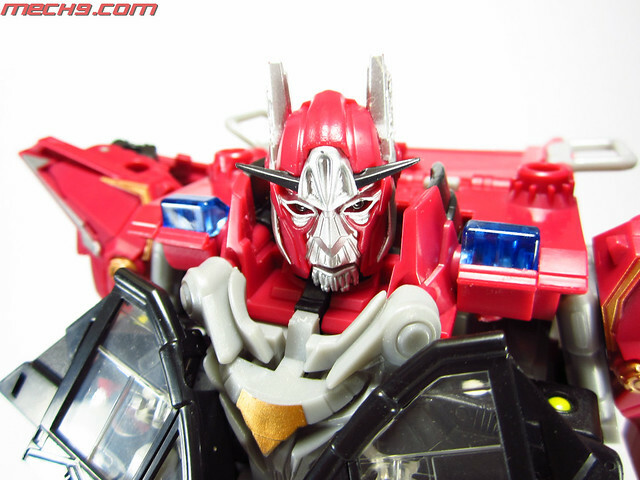 Eyes of Sentinel Prime lights up and the mouth opens up a bit when the chest button is pressed to activate the voice box. 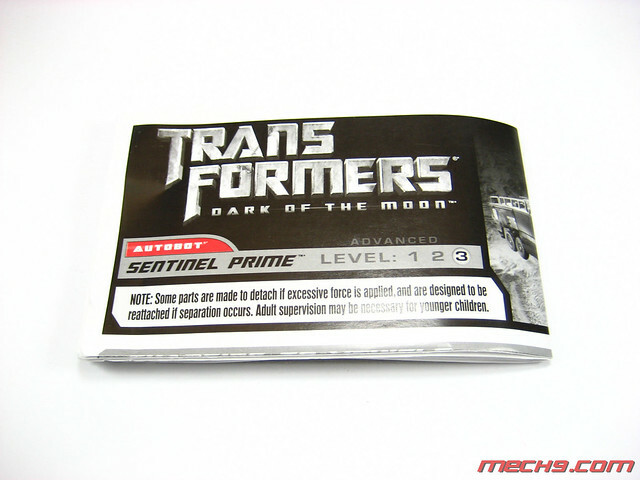 Lousy Transformation manual that comes with the toy because of its small cell sizes that make it hard to see and understand. 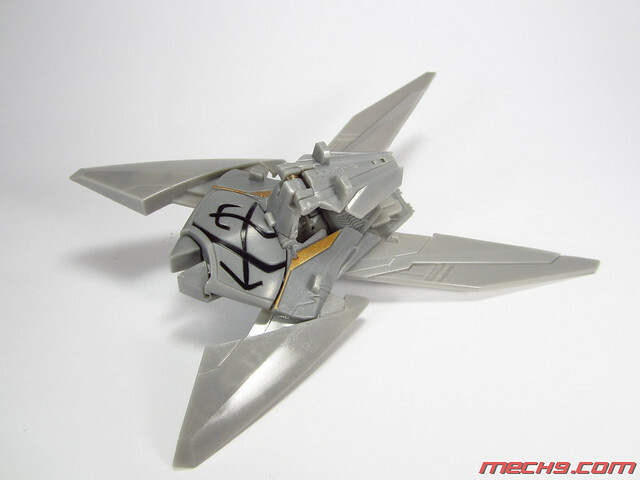 No explaination either, just arrows to show you what to do. 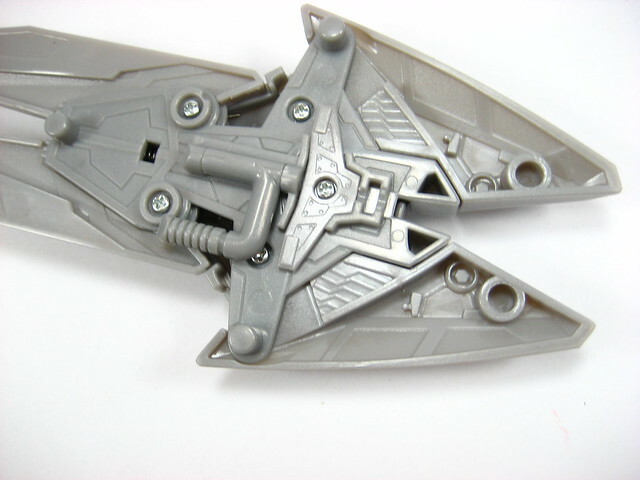 The bladed weapon of Sentinel Prime is folded then stored at the underside of the top panel in truck mode. 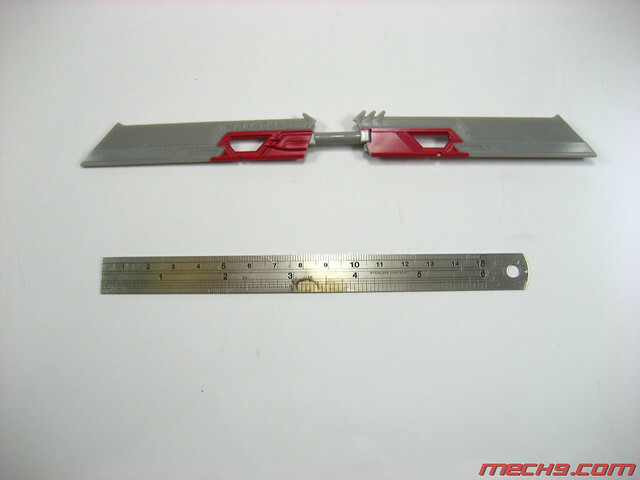 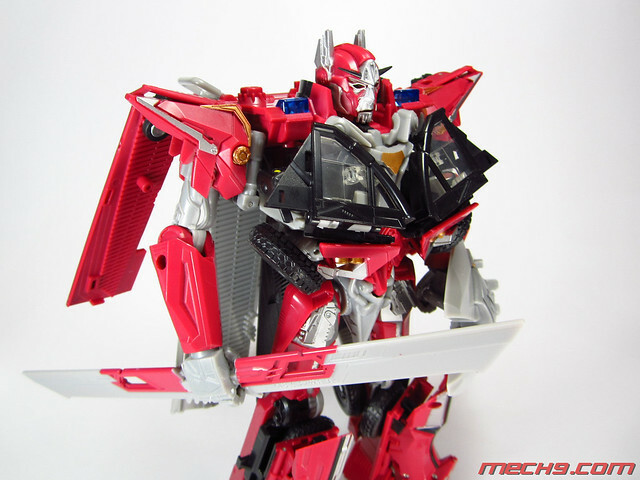 Two bladed weapon of Sentinel Prime beside a ruler for comparison.